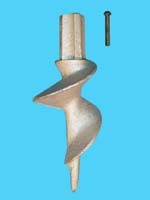 Dock Accessories | Dock Post Sand Augers and Wrench | VE-VE Inc.
D-504; "Sand Auger" ( For 1-1/4" Pipe. ( 1-5/8" O.D. )). 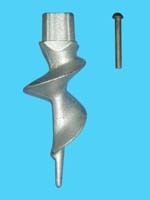 The D-504; "Sand Auger" ( For 1-1/4" Sch. 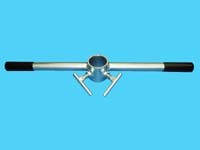 40 Pipe, ( 1-3/8" Inside diameter )), mounts in the inside of the dock pipe and stabilizes it firmly to the lake bottom for added dock stability and support. These are not the lightweight / breakable Aluminum ones, these are made of Solid Cast Iron, weighing 3-1/4 lbs. each. The D-507; "Sand Auger" ( For 1-1/2" Sch. 40 Pipe, ( 1-5/8" Inside diameter )), mounts in the inside of the dock pipe and stabilizes it firmly to the lake bottom for added dock stability and support. These are not the lightweight / breakable Aluminum ones, these are made of Solid Cast Iron, weighing over 3-1/2 lbs. each.